Madarosis is an obvious clinical sign with a varied etiology. This seemingly innocuous sign may be an important manifestation of many local or systemic disorders. The causes, clinical features, and approach to madarosis are discussed in this review. The fibers of the orbicularis oculi, corrugators, and frontal part of the occipitofrontalis are inserted into the dermis of the skin underlying the eyebrows. This helps in changing the contour of the eyebrows and consequently facial expression. There are many causes of madarosis. A useful etiological classification is given in [Table 1]. Blepharitis is a chronic primary eyelid inflammation. It is fairly common in occurrence and being a condition with remissions and relapses, results in a decreased quality of life if adequate measures are not taken. Chronic blepharitis is the most common condition associated with madarosis. Though there are various ways of classifying blepharitis, the most useful is the one proposed by Wilhelm,  wherein blepharitis can be classified based on whether there is a predominant involvement of the part of the eyelid anterior to the gray line (anterior blepharitis), or posterior to the gray line (posterior blepharitis). The gray line is an imaginary line dividing the eyelid into an anterior part consisting of the skin and muscle, and a posterior part consisting of the tarsus and conjunctiva. Anterior blepharitis is usually either staphylococcal or seborrhoeic, and posterior blepharitis refers to any of the varieties of Meibomian gland More Details dysfunction. Scurf refers to the scales and greasy crusts that accumulate along the hair shaft and indicates the presence of seborrhea. , Collarettes are composed of hard fibrinous scales , surrounding each individual eyelash. They travel upward along with the growth of the lashes and are indicative of staphylococcal infection. Sleeves or cylindrical dandruff comprise scales that form a cuff around the lash root and are connected with it, in contrast to greasy scales which are not connected to the lash root. Sleeves indicate infestation with Demodex folliculorum. Staphylococcal blepharitis causes lid margin inflammation and folliculitis which destroys the hair follicle resulting in madarosis  which is usually non-scarring,  but occasionally may be scarring, especially if long standing. Seborrhoeic blepharitis is very often associated with secondary bacterial infections and can result in madarosis either due to associated staphylococcal infection or due to rubbing caused by itching. Posterior blepharitis is also known as meibomian gland dysfunction. MacKenzie and Jones  used the term "ophthalmia tarsi" to refer to blepharitis due to meibomian gland dysfunction. This manifests in childhood with chronic lower eyelid dermatitis and is often associated with other types of allergic disorders. , The ocular features are eyelid dermatitis, Dennie-Morgan fold (an infraorbital fold or line due to lid edema in atopic dermatitis), keratitis, and a frequent association with keratoconus and cataracts. 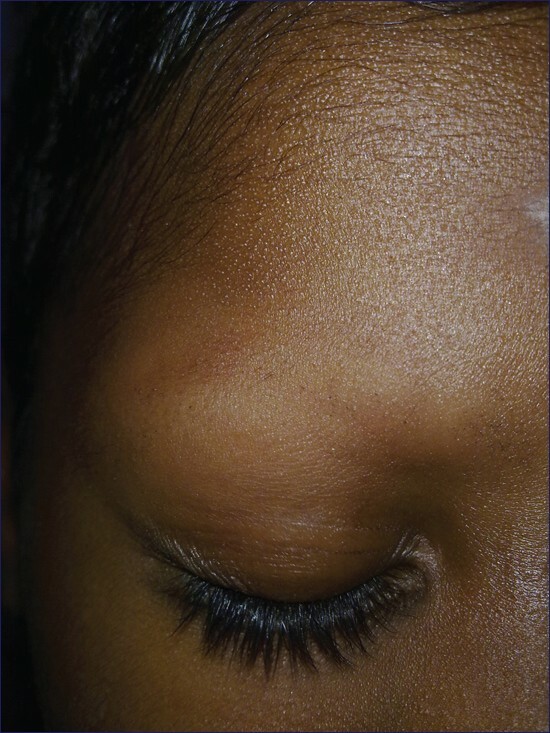 Loss of lateral third of eyebrows (Hertoghe sign)  is seen in atopic dermatitis due to constant scratching and rubbing. 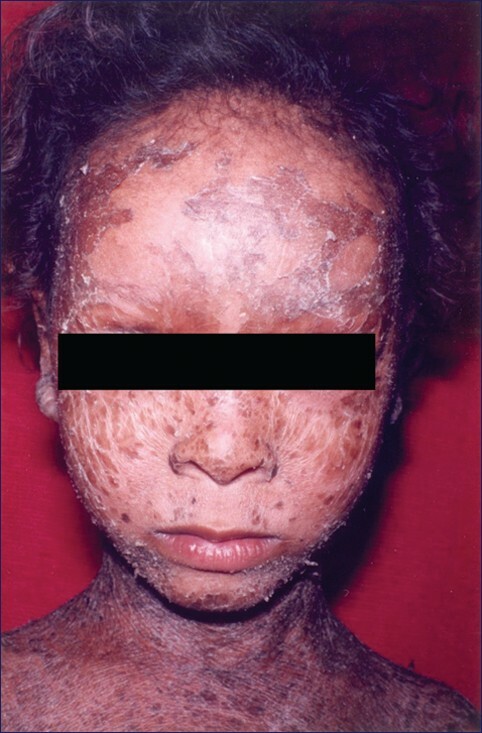 Some of the prominent findings  in lamellar ichthyosis are cicatricial lagophthalmos, ectropion of lids, and madarosis [Figure 1]. Madarosis of non-scarring type is commonly seen in alopecia areata which is a hair-specific autoimmune disease associated with patchy loss of hair. It presents as round or oval patches of non-scarring hair loss. Madarosis occurs as isolated involvement [Figure 2] or as a part of alopecia universalis. When alopecia areata involves the eyelashes exclusively, there is rarely involvement of other parts of the body. Alopecia areata can involve both the eyelids without scalp involvement also. Short exclamation mark hairs are pathognomonic for alopecia areata. Telogen hairs are shed in chronic marasmus  and malnutrition of any type. Madarosis is the hallmark of lepromatous leprosy. It was reported in 76% of patients with multibacillary leprosy. Bilateral symmetric cicatricial madarosis occurs in lepromatous leprosy due to histiocytic infiltration of hair follicles , [Figure 4]. It occurs in multibacillary leprosy after at least 5 to 10 years of untreated disease. Loss or atrophy of the eyelashes may follow. Madarosis adds to the cosmetic disfigurement caused by leprosy. Absence of madarosis is a good prognostic sign in long-standing cases. Unilateral madarosis may occur in tuberculoid leprosy due to the facial patch in the eyebrow region. In tuberculoid leprosy, madarosis occurs due to granulomatous infiltration of hair follicles leading to their destruction. It is an impulse-controlled disorder characterized by compulsive plucking or breakage of hair. The most frequent site of hair pulling is the scalp, but the eyebrows, eyelashes, and pubic hair may also be involved. Trichotillomania manifests in eyelashes and eyebrows as irregular patches of alopecia containing hairs of varying lengths. Inflammation, scarring, and atrophy are conspicuous by their absence. Patients often attempt to conceal their alopecia by cosmetological camouflage. In case of a diagnostic dilemma, histological features such as increased numbers of catagen hairs, pigment casts, and traumatized hair bulbs provide a clue. Madarosis has been reported as a frequent complication of chemotherapy with docetaxel. ,, Garibaldi and Adler described a case that developed madarosis following addition of cetuximab,  and which resolved following discontinuation of the treatment. Razeghinejad et al. described a case of acute madarosis associated with fever, two days following Measles, Mumps and Rubella (MMR) vaccination. There was associated D. folliculorum in one of the eyelids, and though a causal role is speculated, they attribute the triggering factor to be the MMR vaccination. 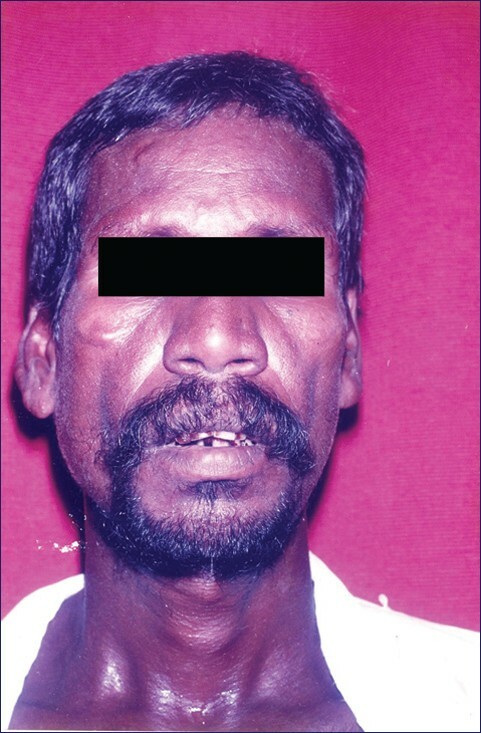 Kowing described a patient who developed unilateral madarosis and alopecia following Botulinum A toxin injections in the left masseter and left temporalis muscles for the treatment of left oromandibular dystonia. Kass et al. described madarosis following chronic epinephrine therapy. Both benign and malignant tumors such as seborrhoeic keratosis, molluscum contagiosum, basal cell carcinoma, squamous-cell carcinoma, sebaceous cell carcinoma, and sclerosing sweat duct carcinoma have been shown to be associated with loss of eyelashes. ,,,,, A sebaceous cell carcinoma very often presents as a recurrent chalazion. An associated madarosis (due to lid infiltration and follicle destruction) would help to differentiate the two. , Tsuji et al. reported a rare case of primary epithelioid hemangioendothelioma of the eyelid associated with madarosis. Primary leiomyoma of the eyelid has been reported with madarosis. Kuan  described a case of lacrimal gland tumor masquerading as blepharitis with madarosis. The most frequent ocular findings  are blepharoconjunctivitis, cicatricial ectropion, meibomianitis, chalazia, and madarosis. Various inherited syndromes may be associated with madarosis. 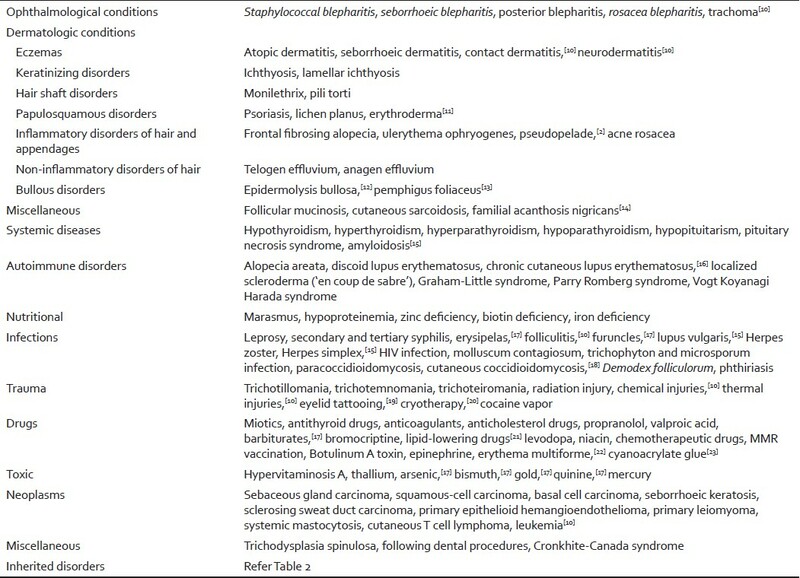 The individual clinical features and type of madarosis are described in [Table 2]. Management of madarosis primarily depends upon treatment of the predisposing disorder. Inherited disorders can be identified by the associated clinical features. Establishing the diagnosis is an important prerequisite for the management of madarosis. For this, madarosis can be broadly classified as scarring and non-scarring. In non-scarring madarosis, generally regrowth of hair occurs after treatment of the primary disorder. In disorders such as lepromatous leprosy, though the madarosis is non-scarring, hair regrowth does not occur. In such cases, and in cases of scarring madarosis, hair transplant is essential for cosmetic purposes. The treatment of the individual disorders responsible for madarosis is beyond the purview of this article. A useful approach to a patient with madarosis is presented in [Figure 5]. Minoxidil , may be used in the topical treatment of eyebrow loss due to alopecia areata in the form of a 5% solution applied twice daily. Hair growth usually starts by 12 weeks, and it reaches its peak by about 12 months. Various techniques have been described over the years. Nylon implants were used by some people. Now, they are banned in many countries because of sequelae-like scarring and infection. Follicular unit transplantation has been found to give very good results  and is now the procedure of choice for most types of hair transplantation. The details of the procedure with respect to eyebrow and eyelash reconstruction will be discussed here. The occipital area is usually used for harvesting the donor strip. Softer texture hair for periocular transplantation may be taken from below the nuchal ridge or the lower part of the parietal scalp. A 1×4-cm elliptical area of skin is removed. It is then dissected under the stereomicroscope  into individual follicular units. Thus, many of the surgical procedures described for eyebrow and eyelash loss have proved to be an effective method of management for scarring madarosis. Madarosis is a clinical sign that has become pathognomonic of leprosy in countries like India. However, this apparently benign clinical sign has wider ramifications in many systemic and dermatological disorders. Hence, establishing a proper diagnosis and appropriate management is mandatory. Though management of the primary disease results in regrowth of eyebrows and eyelashes, many require surgical management. Thus, the management of a patient with madarosis requires a coordinated effort from the dermatologist, ophthalmologist, internist, and reconstructive surgeon. The literature search was conducted with Pubmed, Medline, and Google scholar using the keywords madarosis, eyebrow loss, and eyelash loss for articles from 1960 to September 2011. Only English articles were used as references. Relevant material was also searched in textbooks and used wherever appropriate. We wish to acknowledge Dr. Saravana Kumar for his technical help in preparing the tables. 1. Duke-Elder S, MacFaul P: The ocular adnexa, part I: diseases of the eyelashes In: Duke-Elder S, Editor. System of Ophthalmology, Vol. 13. St Louis: CV Mosby; 1974. p. 373-90. 2. Maguire HC, Hanno R. Diseases of the hair. In: Moschella SL, Hurley HJ, Editors. Dermatology 2 nd ed.Philadelphia: WB Saunders; 1985. p. 1369-86. 3. Standring S. Editor. Gray's anatomy. The anatomical basis of clinical practice. London: Elsevier; 2008. 4. Bron AJ, Tripathi RC, Tripathi BJ. Wollf's anatomy of the eye and orbit. London: Arnold; 2001. 5. Gandelman M. A Technique for Reconstruction of Eyebrows and Eyelashes. Semin Plast Surg 2005;19:153-8. 6. Anderson BG. Madarosis and Myxedema. JAMA 1966;197:153. 8. Vickery SA, Wyatt P, Gilley J. Eye cosmetics. In: Cosmetic Dermatology: Products and Procedures. In; Draelos ZD, Editor. Hoboken, New Jersey: Wiley Blackwell; 2010. p. 191. 9. Robbins CR, Editor. Chemical and physical behavior of human hair. 4 th ed.New York: Springer-Verlag; 2002. p. 8. 10. Khong JJ, Casson RJ, Huilgol SC, Selva D. Madarosis. Surv Ophthalmol 2006;51:550-60. 11. Teran CG, Teran-Escalera CN, Balderrama C. A severe case of erythrodermic psoriasis associated with advanced nail and joint manifestations: A case report. J Med Case Reports 2010;4:179. 12. Swensson O, Christophers E. Generalized atrophic benign epidermolysis bullosa in 2 siblings complicated by multiple squamous cell carcinomas. Arch Dermatol 1998;134:199-203. 13. Daoud YJ, Foster CS, Ahmed R. Eyelid skin involvement in pemphigus foliaceus. Ocul Immunol Inflamm 2005;13:389-94. 14. Chuang SD, Jee SH, Chiu HC, Chen JS, Lin JT. Familial acanthosis nigricans with madarosis. Br J Dermatol 1995;133:104-8. 15. Orentreich DS, Orentreich N. Dermatology of the eyelids, In: Smith BC, Della Rocca RC, Nesi F (editors): Ophthalmic Plastic and Reconstructive Surgery. St. Louis: CV Mosby; 1987. p. 855-906. 16. Pandhi D, Singal A, Rohtagi J. Eyelid involvement in disseminated chronic cutaneous lupus erythematosus. Indian J Dermatol Venereol Leprol 2006;72:370-2. 17. Kass MA, Stamper RL, Becker B. Madarosis in chronic epinephrine therapy. Arch Ophthalmol 1972;88:429-31. 18. Hobbs ER, Hempstead RW. Cutaneous coccidioidomycosis simulating lepromatous leprosy. Int J Dermatol 1984;23:334-6. 19. De Cuyper C. Cosmetic and medical applications of of tattooing. In: De Cuyper C, Cotapos ML, Editors. Dermatologic complications with body art: tattoos, piercings and permanent make-up. Heidelberg: Springer; 2010. p. 53-60. 20. Modjtahedi BS, Alikhan A, Maibach HI, Schwab IR. Diseases of periocular hair. Surv Ophthalmol 2011;56:416-32. 21. Jordan DR, Ahuja N, Khouri L. Eyelash loss associated with hyperthyroidism. Ophthal Plast Reconstr Surg 2002;18:219-22. 22. Sood GC, Sofat BK, Mehrotra SK, Chandel RD. Entropion and madarosis in erythema multiforme. Indian J Dermatol 1973;18:21-2. 23. Needham AD, Natha S, Kaye S. Similarities in the packaging of cyanoacrylate nail glue and ophthalmic preparations: An ongoing problem. Br J Ophthalmol 2001;85:496-7. 24. Wilhelmus KR. Inflammatory disorders of the eyelid margins and eyelashes. Ophthalmol Clin North Am 1992;5:187-94. 25. Jyotosm JB, Golstein MH. Blepharitis. In: Yanoff M, Duker JS, Editors. Ophthalmology. 3 rd ed.Philadelphia: Mosby Elsevier; 2009. p. 219-21. 26. Wexler D, Pace W. Acquired zinc deficiency disease of skin. Br J Dermatol 1977;96:669-72. 27. Starr MB. Infections and hypersensitivity of the eyelids. In: Nesi FA, Lisman RD, Levine MA, Brazzo BG, Gladsone GJ, editors. Smith's Ophthalmic Plastic and Reconstructive Surgery, 2 nd ed.St Louis, MO: CV Mosby; 1998. p. 485-530. 28. Jackson WB. Blepharitis: Current strategies for diagnosis and management. Can J Ophthalmol 2008;43:170-9. 29. Gao YY, Di Pascuale MA, Li W, Liu DT, Baradaran-Rafii A, Elizondo A. High prevalence of Demodex in eye lashes with cylindrical dandruff. Invest Ophthalmol Vis Sci 2005;46:3094-8. 30. Wright P. The eye and skin. In: Verbov J, Editor. Relationships in dermatology. London: Kluwers Academic Publishers; 1988. p. 35-6. 31. Mackenzie W, Jones TW. A Practical treatise on the diseases of the eye. 4 th ed. London: Longman, Brown, Green and Longmans; 1854. 32. Mathers WD, Shields WJ, Sachdev MS, Petroll WM, Jester JV. Meibomian gland dysfunction in chronic blepharitis. Cornea 1991;10:277-85. 33. Smith RE, Flowers CW Jr. Chronic blepharitis: A review. CLAO J 1995;21:200-7. 34. Ghanem VC, Mehra N, Wong S, Mannis MJ. The prevalence of ocular signs in acne rosacea: comparing patients from Ophthalmology and dermatology clinics. Cornea 2003;22:230-3. 35. Acharya N, Pineda R 2 nd , Uy HS, Foster CS. Discoid Lupus Erythematosus Masquerading as Chronic Blepharoconjunctivitis. Ophthalmology 2005;112: e19-23. 36. James WD, berger TG, Elston DM, Editors. 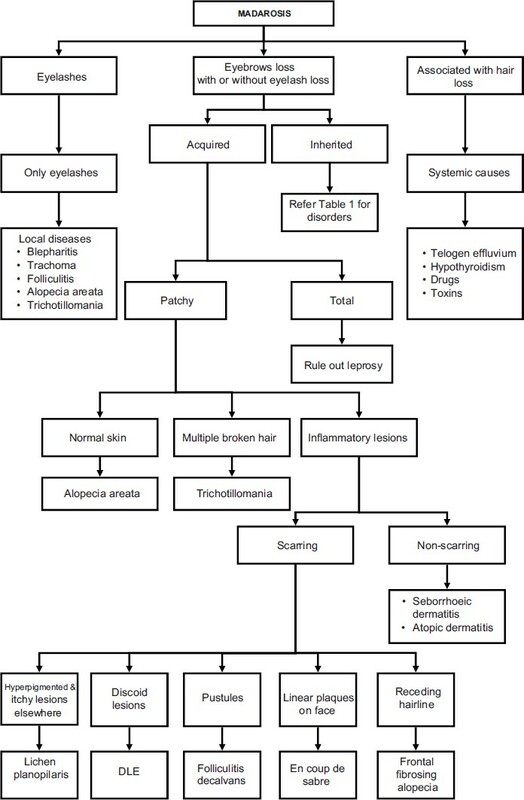 Andrews' diseases of the skin Clinical dermatology. Philadelphia: Saunders Elsevier; 2006. 37. Barankin B, Guenther L. Rosacea and atopic dermatitis. Two common oculocutaneous disorders. Can Fam Physician 2002;48:721-4. 38. Saito R, Hori Y, Kuribayashi T. Alopecia in hypothyroidism. In: Kobori T, Montagna W, Editors. Biology of diseases of the hair. Tokyo: University of Tokyo press; 1976. p. 279-85. 39. Gupta AK, Madzia SE, Batra R. Etiology and management of seborrheic dermatitis. Dermatology 2004;208:89-93. 40. Cruz AA, Menezes FA, Chaves R, Pinto Coelho R, Velasco EF, Kikuta H. Eyelid abnormalities in lamellar ichthyoses. Ophthalmology 2000;107:1895-8. 41. Steiner G, Arffa RC. Psoriasis, ichthyosis and porphyria. Int Ophthalmol Clin 1997;37:41-61. 42. Kossard S, Lee MS, Wilkinson B. Postmenopausal frontal fibrosing alopecia: A frontal variant of lichen planopilaris. J Am Acad Dermatol 1997;36:59-66. 43. Clark SM, Mills CM, Lanigan SW. Treatment of keratosis pilaris atrophicans with the pulsed tunable dye laser. J Cutan Laser Ther 2000;2:151-6. 44. Kligman AM. Pathologic dynamics of human hair loss. I. Telogen effluvium. Arch Dermatol 1961;83:175-98. 45. Hempstead RW, Ackerman AB. Follicular mucinosis. A reaction pattern in follicular epithelium. Am J Dermatopathol 1985;7:245-57. 46. Emmerson RW. Follicular mucinosis. A study of 47 patients. Br J Dermatol 1969;81:395-413. 47. Kendrick CG, Brown RA, Reina R, Ford BP, Reed RJ, Nesbitt LT Jr. Cutaneous sarcoidosis presenting as leonine facies. Cutis 2004;73:57-62. 48. Billoni N, Buan B, Gautier B, Gaillard O, Mahé YF, Bernard BA. Thyroid hormone receptor beta1 is expressed in the human hair follicle. Br J Dermatol 2000;142:645-52. 49. van Beek N, Bodó E, Kromminga A, Gáspár E, Meyer K, Zmijewski MA, et al. Thyroid hormones directly alter human hair follicle functions: anagen prolongation and stimulation of both hair matrix keratinocyte proliferation and hair pigmentation. J Clin Endocrinol Metab 2008;93:4381-8. 50. Rook A. Endocrine Influences on Hair Growth. Br Med J 1965;1:609-14. 51. Comaish JS. The thyroid and hair growth. Semin Dermatol 1985;4:4-8. 52. Leonhardt JM, Heymann WR. Thyroid disease and the skin. Dermatol Clin 2002;20:473-81, vii. 53. Lane Furdell E. Eponymous, anonymous: Queen Anne's sign and the misnaming of a symptom. J Med Biogr 2007;15:97-101. 54. Famuyiwa OO, Bella AF. Thyrotoxicosis in Nigeria. Analysis of a five year experience. Trop Geogr Med 1990;42:248-54. 55. Alonso LC, Rosenfield RL. Molecular genetic and endocrine mechanisms of hair growth. Horm Res 2003;60:1-13. 56. MacDonald Hull SP, Wood ML, Hutchinson PE, Sladden M, Messenger AG. Guidelines for the management of alopecia areata. Br J Dermatol 2003;149:692-9. 57. Barankin B, Taber M, Wasel N. Successful hair transplant of eyebrow alopecia areata. J Cutan Med Surg 2005;9:162-4. 58. Nanda A, Alsaleh QA, Al-Hasawi F, Al-Muzairai I. Thyroid function, autoantibodies, and HLA tissue typing in children with alopecia areata. Pediatr Dermatol 2002;19:486-91. 59. Yoon KH, Lee SH, Ahn SK, Lee WS. A case of alopecia universalis without involvement of scalp hairs. Yonsei Med J 1995;36:97-101. 60. Ricotti C, Tozman E, Fernandez A, Nousari CH. Unilateral eyelid discoid lupus erythematosus. Am J Dermatopathol 2008;30:512-3. 61. Yaghoobi R, Feily A, Behrooz B, Yaghoobi E, Mokhtarzadeh S. Palpebral involvement as a presenting and sole manifestation of discoid lupus erythematosus. ScientificWorldJournal 2010;10:2130-1. 62. Burge SM, Frith PA, Juniper RP, Wojnarowski F. Mucosal involvement in systemic and chronic cutaneous lupus erythematosus. Br J Dermatol 1989;121:727-41. 63. Selva D, Chen CS, James CL, Huilgol SC. Discoid lupus erythematosus presenting as madarosis. Am J Ophthalmol 2003;136:545-6. 64. Peterson LS, Nelson AM, Su WP. Classification of morphoea (localized scleroderma). Mayo Clin Proc 1995:70:106876. 65. Zannin ME, Martini G, Athreya BH, Russo R, Higgins G, Vittadello F, et al. Juvenile Scleroderma Working Group of the Pediatric Rheumatology European Society (PRES). Ocular involvement in children with localised scleroderma: A multi-centre study. Br J Ophthalmol 2007;91:1311-4. 66. Holland KE, Steffes M, Nocton JJ, Schwabe MJ, Jacobson RD, Drolet BA. Linear Scleroderma en coup de sabre with associated neurologic abnormalities. Pediatrics 2006;117;e132-6. 67. Vigilizzo G, Verrini A, Rongioletti F. Familial Lassueur-Graham-Little-Piccardi syndrome. Dermatology 2004;208:142-4. 68. Wartenberg R. Progressive facial hemiatrophy. Arch Neurol Psychiat 1945;54:75-96. 69. Walsh FB, Hoyt WF. Clinical Neuro-ophthalmology. 3 rd ed.Baltimore: Williams and Wilkins Co; 1969. p. 1380-5. 70. Johnson AA, Latham MC, Roe DA. An evaluation of the use of changes in hair root morphology in the assessment of protein-caloric malnutrition. Am J Clin Nutr 1976;29:502-11. 71. Dawber RP, Simpson NB, Barth JH. Diffuse alopecia: Endocrine, metabolic and chemical influences in the follicular cycle. In: Dawber R, Editor. Diseases of the hair and scalp. 3 rd ed.London: Blackwell Scientific; 1997. p. 147. 72. Neldner KH, Hambidge KM, Walravens PA. Acrodermatitis enteropathica. Int J Dermatol 1978;17:380-7. 73. Wirsching L Jr. Eye symptoms in Acrodermatitis enteropathica. A description of a brother and sister, with corneal changes. Acta Ophthalmol (Copenh) 1962;40:567-74. 74. Dabbagh O, Brismar J, Gascon GG, Ozand PT. The clinical spectrum of biotin-treatableencephalopathies in Saudi Arabia. Brain Dev 1994;16 Suppl:72-80. 75. Trost LB, Bergfeld WF, Calogeras E. The diagnosis and treatment of iron deficiency and its potential relationship to hair loss. J Am Acad Dermatol 2006;54:824-44. 76. 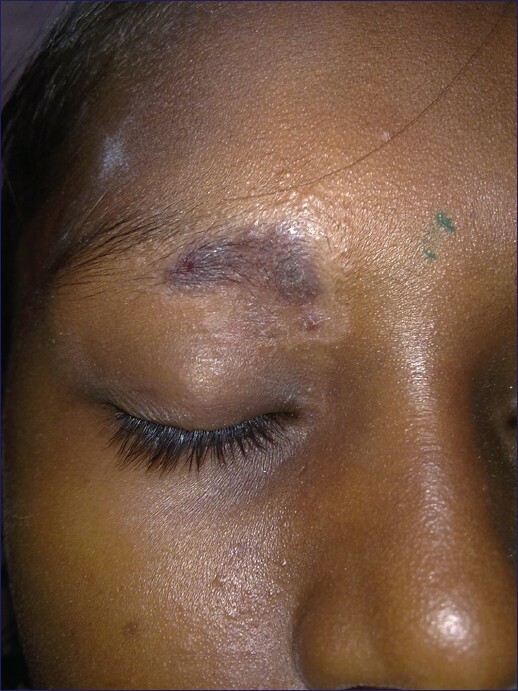 Soshamma G, Suryawanshi N. Eye lesions in leprosy. Lepr Rev 1989;60:33-8. 77. Kingery FA. Eyebrows, plus or minus. JAMA 1966:195;571. 78. Mvogo CE, Bella-Hiag AL, Ellong A, Achu JH, Nkeng PF. Ocular complications of leprosy in Cameroon. Acta Ophthalmol Scand 2001;79:31-3. 79. Hogeweg M. Leprosy and the eye. Community Eye Health 1989;3:2-5. 80. Choyce DP. Ocular leprosy, with reference to certain cases shown. Proc R Soc Med 1955;48:108-12. 81. Ploeg De, Stagnone JJ. Eyebrow alopecia in secondary syphilis. Arch Dermatol 1964;90:172-3. 82. Oztaº P, Catal F, Dilmen U. Familial eyebrow diffuse alopecia. J Eur Acad Dermatol Venereol 2005;19:118-9. 83. Holz HA, Espandar L, Moshirfar M. Herpes Zoster Ophthalmicus (HZO). In: Yanoff M, Duker JS, Editors. Ophthalmology. 3 rd ed.Philadelphia: Mosby Elsevier; 2009. p. 222-5. 84. Mansour AM. Adnexal findings in AIDS. Ophthal Plast Reconstr Surg 1993;9:273-9. 85. Cruz AA, Zenha F, Silva JT Jr, Martinez R. Eyelid involvement in paracoccidioidomycosis. Ophthal Plast Reconstr Surg 2004;20:212-6. 86. Basak SA, Berk DR, Lueder GT, Bayliss SJ. Common features of periocular tinea. Arch Ophthalmol 2011;129:306-9. 87. Brown AC. The First Human Hair Symposium. [papers]. New York: Medcom Press; 1974. 88. Kemal M, Sümer Z, Toker MI, Erdoðan H, Topalkara A, Akbulut M. The Prevalence of Demodex folliculorum in blepharitis patients and the normal population. Ophthalmic Epidemiol 2005;12:287-90. 89. Dawber RP, Fenton DA. Infections and infestations. In: Dawber R, editor. Diseases of the hair and scalp. 3 rd ed.London: Blackwell Science; 1997. p. 438-9. 90. Thappa DM, Karthikeyan K, Jeevankumar B. Phthiriasis palpebrarum. Postgrad Med J 2003;79:102. 91. Smith JR. Trichotillomania: Ophthalmic presentation. Aust N Z J Ophthalmol 1995;23:59-61. 92. Happle R. Trichotemnomania: Obsessive-compulsive habit of cutting or shaving the hair. J Am Acad Dermatol 2005;52:157-9. 93. Tames SM, Goldenring JM. Madarosis from cocaine use. N Engl J Med 1986;314:1324. 94. Paus R, Cotsarelis G. The biology of hair follicles. N Engl J Med 1999;341:491-7. 95. Tsina EK, Lane AM, Zacks DN, Munzenrider JE, Collier JM, Gragoudas ES. Treatment of metastatic tumors of the choroid with proton beam irradiation. Ophthalmology 2005;112:337-43. 96. Durkin SR, Roos D, Higgs B, Casson RJ, Selva D. Ophthalmic and adnexal complications of radiotherapy. Acta Ophthalmol Scand 2007;85:240-50. 97. Barabino S, Raghavan A, Loeffler J, Dana R. Radiotherapy-induced ocular surface disease. Cornea 2005;24:909-14. 98. Tosti A, Pazzaglia M. Drug reactions affecting hair: Diagnosis. Dermatol Clin 2007;25:223-31. 99. Roy F, Editor. Ocular syndromes and systemic diseases. New York: Grune and Stratton; 1985. p. 115-7. 100. Tudhope GR, Cohen H, Meikle RW. Alopecia following Treatment with Dextran Sulphate and Other Anticoagulant Drugs. Br Med J 1958;1:1034-7. 101. Martin CM, Southwick EG, Maibach HI. Propranolol induced alopecia. Am Heart J 1973;86:236-7. 102. Clayton-Smith J, Donnai D. Fetal valproate syndrome. J Med Genet 1995;32:724-7. 103. Stein KM, Odom RB, Justice GR, Martin GC. Toxic alopecia from ingestion of boric acid. Arch Dermatol 1973;108:95-7. 104. Marshall A, William MJ. Alopecia and levodopa. Br Med J 1971;2:47. 105. Fraunfelder FW, Fraunfelder FT, Illingworth DR. Adverse ocular effects associated with niacin therapy. Br J Ophthalmol 1995;79:54-6. 106. Kaya AO, Buyukberber S, Coskun U, Yildiz R, Ozturk B, Yaman E, et al. Acute erythema and edematous skin reaction and ectropion following docetaxel in a patient with non-small cell lung cancer. Cutan Ocul Toxicol 2008;27:327-31. 108. Cetinkaya A, Hudak D, Kulwin D. Cicatricial Entropion Following Docetaxel (Taxotere) Therapy. Ophthal Plast Reconstr Surg 2011;27: e113-6. 109. Garibaldi DC, Adler RA. Cicatricial ectropion associated with treatment of metastatic colorectal cancer with cetuximab. Ophthal Plast Reconstr Surg 2007;23:62-3. 110. Marr B, Gobin PY, Dunkel IJ, Brodie SE, Abramson DH. Spontaneously Resolving Periocular Erythema and Ciliary Madarosis Following Intra-arterial Chemotherapy for Retinoblastoma. Middle East Afr J Ophthalmol 2010;17:207-9. 111. Gobin YP, Dunkel IJ, Marr BP, Brodie SE, Abramson DH. Intra-arterial Chemotherapy for the Management of Retinoblastoma: Four-Year Experience. Arch Ophthalmol 2011;129:732-7. 112. Moti SE, Fausel C. Recurring Chemotherapy-Associated Alopecia Areata: Case Report and Literature Review. Pharmacotherapy 2003;23:104-8. 113. Hinds, G, Thomas VD. Malignancy and Cancer Treatment-Related Hair and Nail Changes. Dermatol Clin 2008;26:59-68. 114. Razeghinejad MR, Nowroozzadeh MH, Sharifi M, Monabati A. Acute-onset madarosis following MMR vaccination. J Pediatr Ophthalmol Strabismus 2009;46:123-4. 115. Kowing D. Madarosis and Facial Alopecia Presumed Secondary to Botulinum A Toxin Injections. Optom Vis Sci 2005;82:579-82. 116. Oliver TK Jr, Havener WH. Eye manifestations of chronic vitamin A intoxication. AMA Arch Ophthalmol 1958;60:19-22. 117. Gupta AK, Goldfarb MT, Ellis CN, Voorhees JJ. Side effect profile of acitretin therapy in psoriasis. J Am Acad Dermatol 1989;20:1088-93. 118. Tromme I, Van Neste D, Dobbelaere F, Bouffioux B, Courtin C, Dugernier T, et al. Skin signs in the diagnosis of thallium poisoning. Br J Dermatol 1998;138:321-5. 119. Jakobiec FA, Zakka FR, Hatton MP. Eyelid basal cell carcinoma developing in an epidermoid cyst: A previously unreported event. Ophthal Plast Reconstr Surg 2010;26:491-4. 120. Kodama T, Tane N, Ohira A, Maruyama R, Fukuyama J. Sclerosing sweat duct carcinoma of the eyelid. Jpn J Ophthalmol 2004;48:7-11. 121. Shields JA, Demirci H, Marr BP, Eagle RC Jr, Shields CL. Sebaceous carcinoma of the ocular region: a review. Surv Ophthalmol 2005;50:103-22. 122. Cook BE Jr, Bartley GB. Treatment options and future prospects for the management of eyelid malignancies: An evidence-based update. Ophthalmology 2001;108:2088-98. 123. Tsuji H, Kanda H, Kashiwagi H, Mimura T. Primary epithelioid haemangioendothelioma of the eyelid. Br J Ophthalmol 2010;94:261-2. 124. Hui JI, Buchser NM, Dubovy SR. Primary eyelid leiomyoma. Ophthal Plast Reconstr Surg 2011;27: e102-3. 125. National healthcare group. Singapore: c2010. Available from: http://www.teigrandround.com.sg/images/gallery/1273825807_20100506%20YeoTK%20O CULO.pdf [cited on 2011 Sep 1]. 126. Chodkiewicz HM, Cohen PR. Systemic mastocytosis-associated leonine facies and eyebrow loss. South Med J 2011;104:236-8. 127. Leib ML, Lester H, Braunstein RE, Edelson RL. Ocular findings in cutaneous T-cell lymphoma. Ann Ophthalmol 1991;23:182-6. 128. Schwieger-Briel A, Balma-Mena A, Ngan B, Dipchand A, Pope E. Trichodysplasia spinulosa-a rare complication in immunosuppressed patients. Pediatr Dermatol 2010;27:509-13. 129. Holzer AM, Hughey LC. Trichodysplasia of immunosuppression treated with oral valganciclovir. J Am Acad Dermatol 2009;60:169-72. 130. Heaphy MR Jr, Shamma HN, Hickmann M, White MJ. Cyclosporine-induced folliculodystrophy. J Am Acad Dermatol 2004;50:310-5. 131. van der Meijden E, Janssens RW, Lauber C, Bouwes Bavinck JN, Gorbalenya AE, Feltkamp MC. Discovery of a New Human Polyomavirus Associated with Trichodysplasia Spinulosa in an Immunocompromized Patient. PLoS Pathog 2010;6: e1001024. 132. Haycox CL, Kim S, Fleckman P, Smith LT, Piepkorn M, Sundberg JP, et al. Trichodysplasia spinulosa-a newly described folliculocentric viral infection in an immunocompromised host. J Investig Dermatol Symp Proc 1999;4:268-71. 133. Wyatt AJ, Sachs DL, Shia J, Delgado R, Busam KJ. Virus-associated trichodysplasia spinulosa. Am J Surg Pathol 2005;29:241-6. 134. Sadler GM, Halbert AR, Smith N, Rogers M. Trichodysplasia spinulosa associated with chemotherapy for acute lymphocytic leukaemia. Australas J Dermatol 2007;48:110-4. 135. Osswald SS, Kulick KB, Tomaszewski MM, Sperling LC. Viral-associated trichodysplasia in a patient with lymphoma: a case report and review. J Cutan Pathol 2007;34:721-5. 136. Lee JS, Frederiksen P, Kossard S. Progressive trichodysplasia spinulosa in a patient with chronic lymphocytic leukaemia in remission. Australas J Dermatol 2008;49:57-60. 137. Holzer AM, Hughey LC. Trichodysplasia of immunosuppression treated with oral valganciclovir. J Am Acad Dermatol 2009;60:169-72. 138. Benoit T, Bacelieri R, Morrell DS, Metcalf J. Viral-associated trichodysplasia of immunosuppression: Report of a pediatric patient with response to oral valganciclovir. Arch Dermatol 2010;146:871-4. 139. Nezafati S, Rahimi S, Mohseni H. Temporary eyelash loss following dental treatment. Int J Oral Maxillofac Surg 2010;39:1142-4. 140. Narendra, Shenoy SD, Bejoy P, Srinivas CR. Cronkhite-Canada Syndrome. Indian J Dermatol 1997;42:102-5. 141. 11 th annual David W Smith workshop on malformations and morphogenesis. Symposium on Hallerman - Streiff syndrome. Am J Med Genet 1991;41:487-523. 142. Rajagopalan K, Tay CH. Hidrotic ectodermal dysplasia: study of a large Chinese pedigree.Arch Dermatol 1977;113:481-5. 143. Pinheiro M, Ideriha MT, Chautard-Freire-Maia EA, Freire-Maia N, Primo-Parmo SL. Christ-Siemens-Touraine syndrome. Investigations on two large Brazilian kindreds with a new estimate of the manifestation rate among carriers. Hum Genet 1981;57:428-31. 144. Clarke A. Hypohidrotic ectodermal dysplasia. J Med Genet 1987;24:659-63. 145. Gelles LN. Picture of the month. Pili torti. Arch Pediatr Adolesc Med 1999;153:647-48. 146. Gorlin RJ, Miskin Lh, St Geme JW. Oculodentodigital dysplasia. J Pediatr 1963;63:69-75. 147. Skinner BA, Greist MC, Norins AL. The keratitis, ichthyosis, and deafness (KID) syndrome. Arch Dermatol 1981;117:285-9. 148. Larizza L, Roversi R, Volpi L. Rothmund-Thomson syndrome. Orphanet J Rare Dis 2010;5:2. 149. Powell J. Increasing the likelihood of early diagnosis of Netherton syndrome by simple examination of eyebrow hairs. Arch Dermatol 2000;136:423-4. 150. Landy SJ, Donnai D. Incontinentia pigmenti (Bloch-Sulzberger syndrome). J Med Genet 1993; 30:53-9. 151. Wiklund DA, Weston WL. Incontinentia pigmenti. A four-generation study. Arch Dermatol 1980;116:701-3. 152. Celik HH, Surucu SH, Aldur MM, Ozdemir BM, Karaduman AA, Cumhur MM. Light and scanning electron microscopic examination of late changes in hair with hereditary trichodysplasia (Marie Unna hypotrichosis). Saudi Med J 2004;25:1648-51. 154. Vigilizzo G, Verrini A, Rongioletti F. Familial Lassueur-Graham-Little-Piccardi syndrome. Dermatology 2004;208:142-4. 155. Agarwal US, Sitaraman S, Mehta S, Panse G. Hutchinson-Gilford progeria syndrome. Indian J Dermatol Venereol Leprol 2010;76:591. 156. Lee MK, Lee YS. Anesthesia of a patient with Dubowitz syndrome -A case report. Korean J Anesthesiol 2010;58:495-9. 157. Roberts A, Allanson J, Jadico SK, Kavamura MI, Noonan J, Opitz JM, et al. The cardiofaciocutaneous syndrome. J Med Genet 2006;43:833-42. 158. Hartman RD, Molho-Pessach V, Schaffer JV. Conradi-Hünermann-Happle syndrome. Dermatol Online J 2010;16:4. 159. Newbold PC. The skin in genetically-controlled metabolic disorders. J Med Genet 1973;10:101-11. 160. Jorgenson RJ. Ectodermal dysplasia with hypotrichosis, hypohidrosis, defective teeth and unusual dermatoglyphics (Basan syndrome?). Birth Defects 1974;X:323-5. 161. Zlotogorski A, Panteleyev AA, Aite VM, Christiano AM. Clinical and molecular diagnostic criteria congenital atrichia papular lesions. J Invest Dermatol 2002;118:887-90. 162. McGaughran J, Aftimos S. Setleis syndrome: Three new cases and a review of the literature. Am J Med Genet 2002;111:376-80. 163. Pruszkowski A, Bodemer C, Fraitag S, Teillac-Hamel D, Amoric JC, de Prost Y. Neonatal and infantile erythrodermas: a retrospective study of 51 patients. Arch Dermatol 2000;136:875-80. 164. Chitty LS, Dennis N, Baraitser M. Hidrotic ectodermal dysplasia of hair, teeth, and nails: Case reports and review. J Med Genet 1996;33:707-10. 165. Fried K. Autosomal recessive hydrotic ectodermal dysplasia. J Med Genet 1977;14:137-9. 166. Tse DT, Gilberg SM. Malignant eyelid tumors. In: Krachmer JH, Mannis MJ, Holland EJ, editors. Cornea Vol I Philadelphia: Mosby Elsevier; 2005. p. 476-7. 167. Bankier A. Menkes disease. J Med Genet 1995;32:213-5. 168. Dokal I. Dyskeratosis congenita in all its forms. Br J Haematol 2000;110:768-79. 169. Mäkitie O, Sulisalo T, de la Chapelle A, Kaitila I. Cartilage-hair hypoplasia. J Med Genet 1995;32:39-43. 170. Lüdecke HJ, Schaper J, Meinecke P, Momeni P, Gross S, von Holtum D. Genotypic and phenotypic spectrum in tricho-rhino-phalangeal syndrome types I and III. Am J Hum Genet 2001;68:81-91. 171. Itin PH, Fistarol SK. Hair Shaft Abnormalities -Clues to Diagnosis and Treatment. Dermatology 2005;211:63-71. 172. Inamadar AC, Palit A. Photosensitivity in children: an approach to diagnosis and management. Indian J Dermatol Venereol Leprol 2005;71:73-9. 173. Szlazak J. Treacher Collins syndrome. Can Med Assoc J 1953;69:274-6. 174. Tamayo L. Monilethrix treated with the oral retinoid Ro 10-9359 (Tigason). Clin Exp Dermatol 1983;8:393-6. 175. Rubegni P, Fimiani M, Tosi GM, De Aloe G, Miracco C, Andreassi L. Conjunctival edema and alopecia of the external third of the eyebrows in a patient with Meige syndrome. Graefe's Arch Clin Exp Ophthalmol.2000;238:98-100. 176. Tietz W. A syndrome of deaf-mutism associated with albinism showing dominant autosomal inheritance. Am J Hum Genet 1963;15:259-64. 177. König A, Happle R, Tchitcherina E, Schaefer JR, Sokolowski P, Köhler W, et al. An X- linked gene involved in androgenetic alopecia: a lesson to be learned from adrenoleukodystrophy. Dermatology 2000;200:213-8. 178. Spurek M, Taylor-Gjevre R, Van Uum S, Khandwala HM. Adrenomyeloneuropathy as a cause of primary adrenal insufficiency and spastic paraparesis. CMAJ 2004;171:1073-7. 179. Alpay F, Gül D, Lenk MK, Oður G. Severe intrauterine growth retardation, aged facial appearance, and congenital heart disease in a newborn with Johanson-Blizzard syndrome. Pediatr Cardiol 2000;21:389-90. 180. Faiyaz-Ul-Haque M, Zaidi SH, Al-Ali M, Al-Mureikhi MS, Kennedy S, Al-Thani G, et al. A novel missense mutation in the galactosyltransferase-I (B4GALT7) gene in a family exhibiting facioskeletal anomalies and Ehlers-Danlos syndrome resembling the progeroid type. Am J Med Genet A 2004;128A:39-45. 181. van der Velden EM, Drost BH, Ijsselmuiden OE, Baruchin AM, Hulsebosch HJ. Dermatography as a new treatment for alopecia areata of the eyebrows. Int J Dermatol 1998;37:617-21. 182. Price VH. Treatment of hair loss. N Engl J Med 1999 23;341:964-73. 183. Alkhalifah A. Topical and intralesional therapies for alopecia areata. Dermatol Ther 2011;24:355-63. 184. Johnstone MA. Hypertrichosis and increased pigmentation of eyelashes and adjacent hair in the region of the ipsilateral eyelids of patients treated with unilateral topical latanoprost. Am J Ophthalmol 1997;124:544-7. 185. Mehta JS, Raman J, Gupta N, Thoung D. Cutaneous latanoprost in the treatment of alopecia areata. Eye (Lond) 2003;17:444-6. 186. Coronel-Pérez IM, Rodríguez-Rey EM, Camacho-Martínez FM. Latanoprost in the treatment of eyelash alopecia in alopecia areata universalis. J Eur Acad Dermatol Venereol 2010;24:481-5. 187. Faghihi G, Andalib F, Asilian A. The efficacy of latanoprost in the treatment of alopecia areata of eyelashes and eyebrows. Eur J Dermatol 2009;19:586-7. 188. Wester ST, Lee WW, Shi W. Eyelash growth from application of bimatoprost in gel suspension to the base of the eyelashes. Ophthalmology 2010;117:1024-31. 189. Cohen JL. Enhancing the Growth of Natural Eyelashes: The Mechanism of Bimatoprost-Induced Eyelash Growth. Dermatol Surg 2010;36:1361-71. 190. Yoelin S, Walt JG, Earl M. Safety, effectiveness, and subjective experience with topical bimatoprost 0.03% for eyelash growth. Dermatol Surg 2010;36:638-49. 191. Vila TO, Camacho Martinez FM. Bimatoprost in the treatment of eyelash universalis alopecia areata. Int J Trichology 2010;2:86-8. 192. Jones D. Enhanced Eyelashes: Prescription and Over-the-Counter Options. Aesthetic Plast Surg 2011;35:116-21. 193. Woodward JA, Haggerty CJ, Stinnett SS, Williams ZY. Bimatoprost 0.03% gel for cosmetic eyelash growth and enhancement. J Cosmet Dermatol 2010;9:96-102. 194. Avram M. Follicular Unit Transplantation for Male and Female Pattern Hair Loss and Restoring Eyebrows. Ophthalmol Clin N Am 2005;18:319-23. 195. Ergün SS, Sahinoðlu K. Eyebrow transplantation. Ann Plast Surg 2003;51:584-6. 196. Civaº E, Aksoy B, Aksoy HM, Eski M, Yucel K. Hair transplantation for therapy-resistant alopecia areata of the eyebrows: is it the right choice? J Dermatol 2010;37:823-6. 197. Gandelman M. Eyebrow and eyelash transplantation. In: Unger WP, Editor. Hairtransplantation. New York: Marcel Deker; 1995. p. 294. 198. Limmer BL. Elliptical donor stereoscopically assisted micrografting as an approach to further refinement in hair transplantation. Dermatol Surg 1994;20:789-93. 199. Bernstein RM, Rassman WR. Follicular Unit Transplantation. Dermatol Clin 2005;23:393-414, v.
200. Rassman WR, Bernstein RM, McClellan R, Jones R, Worton E, Uyttendaele H. Follicular unit extraction: minimally invasive surgery for hair transplantation. Dermatol Surg 2002;28:720-8. 201. Hirai T, Inoue N, Nagamoto K. Potential use of beards for single-follicle micrografts: convenient follicle-harvesting technique using an injection needle. Ann Plast Surg 2001;47:37-40. 202. Poddar M, Spieth K, Kaufmann R. Er: YAG laser-assisted hair transplantation in cicatricial alopecia. Dermatol Surg 2000;26:1010-4. 203. Pathomvanich D. Anatomical Restoration Surgery of the Eyebrow in Asian. Thai J Surg 2004;25:47-52. 204. Toscani M, Fioramonti P, Ciotti M, Scuderi N. Single Follicular Unit Hair Transplantation to Restore Eyebrows. Dermatol Surg 2011;37:1153-8. 205. Kasai K. Eyelash reconstruction with strip composite eyebrow graft. Ann Plast Surg 2008;60:649-51. 206. Imagawa K. Eyelash transplant. In: Pathomvanich D, Imagawa K. editors. Hair restoration surgery in Asians. Tokyo: Springer; 2010. p. 223-6.